Well before mining, comes exploration. The North has vast untapped potential. Done carefully and under the stringent rules we have, exploration and mining has very little environmental impact. Maybe most importantly, successful exploration sustains mining, and the related benefits. Mines are great ways to create jobs, business benefits, improve community well-being, and contribute to governments through taxes and royalty payments. Governments need that kind of benefit too to generate money to pay for education, health care, transportation, and other things that tax payers want and need. Exploration is a risky business, and only about one in one thousand targets become a mine (for a world class mine, it’s riskier, with only 1 in 3,333 projects becoming a world class mine. And mines aren’t just found overnight. Clearly, it’s difficult to find a mine, and it takes years, even decades for an exploration target to become a mine. That’s why we need more sharp-eyed “rock detectives” to help keep the northern mining industry strong and generating benefits. Prospectors and geoscientists initially stake mineral claims and then collect rock samples. These explorers use a variety of geoscience tools, specifically geology, geochemistry, and geophysics. During what is called grassroots exploration, geologists are hoping to find clues that signal that a mineral deposit that can be mined might be hidden beneath the surface. They will use a variety of tools from geological mapping to examine any rocks that might be exposed, to geochemistry (sampling soils, water of rivers, lakes, and streams, and even plants) to find clues. They will likely use geophysical techniques that measure such qualities as the magnetism, electrical conductivity and resistivity, and/or the gravity of the target area to collect additional clues. Mineral exploration has a small and virtually negligible footprint. 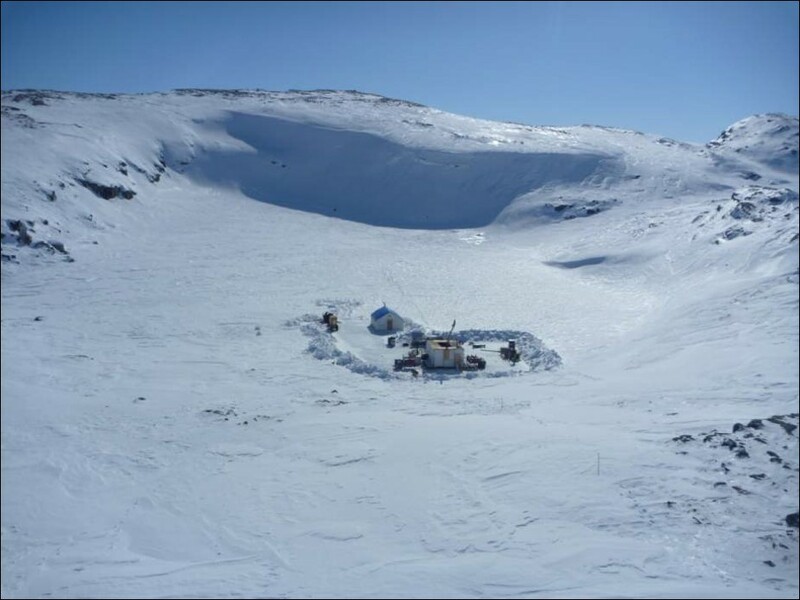 Here is a barely visible exploration drill rig (centre), at Agnico Eagle’s Whale Tail gold deposit, on the Amaruq Property in Nunavut’s Kivalliq Region. 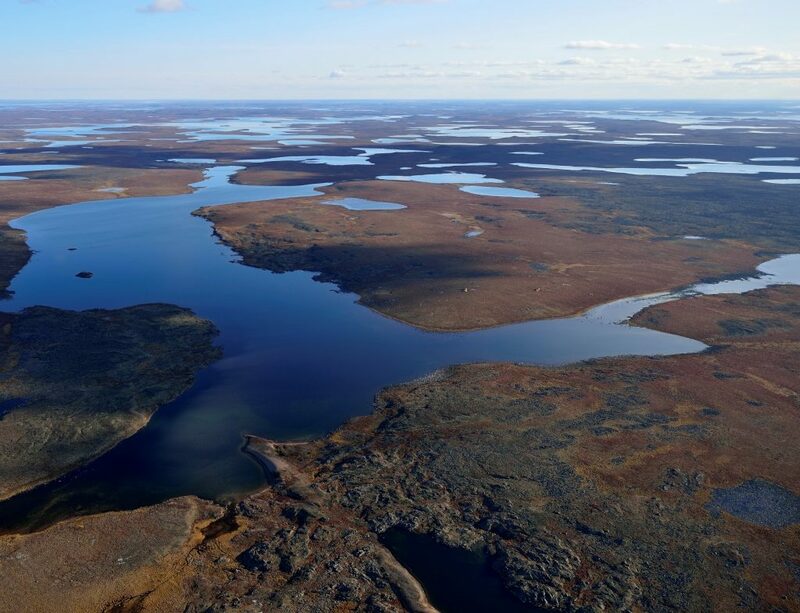 If all clues spell “we think we’ve found something,” they will bring in drills to sample what they can’t see beneath the ground by removing rock cores (diamond drills) or rock chips (reverse circulation drills). Finally, being able to see the target rock as the drills bring up the hidden samples, they may dance a little two step in celebration for having found what appears to be a deposit. Now begins some more expensive work under what is called advanced exploration as the explorers try to answer the big question: how big is it (length, width, depth), is it one piece or broken up into many, and is it strongly mineralized (rich) or weakly (not so rich) throughout? Learning more about the discovery through advanced exploration can take months or even years as exploration proceeds to unravel more information. It also takes considerably more money, from tens to even 100’s of millions of dollars. Many drills may be brought in simultaneously drill for samples to get answers more quickly. Sometimes bigger samples than what a drill can provide are required, and explorers must go underground to take bulk samples for processing.